Enjoy yourself on 15 wooded acres surrounded by water on 3 sides with a private entrance. Fishing and all water sports are readily available to our guests or you can enjoy a leisurely hike throughout the peninsula. We're near the famous Land Between The Lakes (LBL) area, shopping centers of Benton and Paducah, and many shops for the antique hunter. 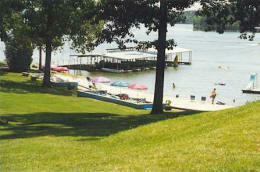 Relax in modern air conditioned 1, 2 and 3 bedroom cottages with delightful screen porches overlooking the lake. Great restaurants, parks and golf courses are nearby. Relaxing, fun-filled days await you and your family at Shawnee Bay Resort. Kentucky Lake, acclaimed as one of the finest year 'round fishing lakes in the country, sponsors many national bass tournaments. Crappie fishing is excellent, or load up your stringer with sauger, striped bass, catfish or bluegill.